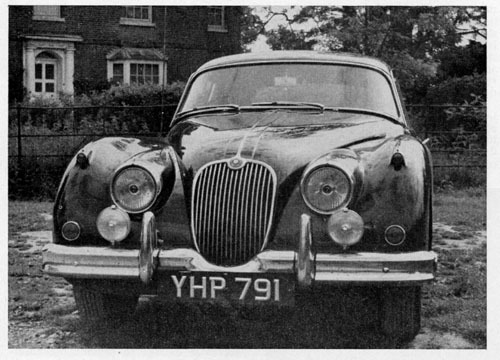 LAST year we tested the 3.4 litre version of the Jaguar XK 150S. It has therefore been extremely interesting to sample a similar car with the 3.8-litre engine, which is now available on demand at a moderate extra cost. Irrespective of engine size, the "S" series Jaguar has a straight port-type cylinder head which is painted old gold for identification. It carries three 2 ins. SU carburetters, and gives a compression ratio of 9 to 1. Other differences include lead-bronze bearings, a lighter flywheel and a special clutch. The chassis follows the lines of previous XK models. The frame is an extremely rugged box-section structure, with torsion-bar independent front suspension and rack and pinion steering. At the rear, a rigid axle on semi-elliptic springs is retained, the drive from the four-speed gearbox going through a conventional open shaft. Thus, the design is certainly well tried and of classical simplicity. One of the most important features of the car is the braking system. Dunlop discs are installed all round with servo operation, and the hand brake is of the "fly-off" type. Centre locking wire wheels are fitted with Dunlop RS4 tyres. Although the machine is compact, it is of extremely solid construction and no attempt at weight reduction has been made. The fixed-head coupe body is a thoroughly practical type. It has very wide doors containing useful pockets, and the whole interior is well padded, including even the instrument panel. I much prefer this functional interior treatment to the earlier polished wooden facia, and from the point of view of safety the improvement is obvious. The discreet smell of real leather underlines the general air of quality. The two main seats are separate, and can be adjusted for the tallest driver, though they might with advantage provide more positive lateral location. The rear seats are really intended for children. Though the luggage boot is not enormous, it has quite a useful capacity. The driving position is a fairly "flat" one, but very comfortable for long journeys. An adjustable steering wheel is a much appreciated feature and the controls are conveniently arranged. The windscreen seems a little shallow by modern standards, but in fact the visibility is good and the bonnet is not aggressIvely long. The test car, which was finished in dark green, was certainly as attractive to look upon as it was exciting to drive. As with previous Jaguar models, I found that the normal tyre pressures were far too spongy for anything but the most gentle driving. The handling was generally "soft" and, though the ride was most luxurious, some more air was found to be advantageous before the full potential of the car could safely be displayed. The maximum speed of 136.3 m.p.h. was timed with all equipment in place, including fog lamps, radio aerial, etc. Obviously, a little "cleaning up" would put a genuine 140 m.p.h. "in the bag", and in fact that speed may be touched under favourable conditions with the car in normal trim. This is an enormous velocity for a luxurious touring car, and in practical terms it means that there is spectacular acceleration available for overtaking, even at a Motorway cruising speed of 100 m.p.h. or more. The acceleration is of the kick-in-the-back variety right up the scale, but the potential figures could not be recorded because of wheelspin on the getaway. The 3.4-litre which I tested had a limited-slip differential. Such a component was presumably fitted to the "3.8", yet propeller shaft torque caused the right-hand rear wheel to spin all too easily. In consequence, the initial acceleration was inferior to that recorded for the earlier car, but only because the power could not be transmitted to the road, I would guess that a standing quarter-mile in 14 seconds, and other figures of a similar order, could easily be recorded if independent rear suspension were adopted. Once the car has been "unstuck" the bigger engine gives a noticeably livelier performance. For example, it reaches 120 m.p.h. in 4.2 seconds less time than the XK 120 took to achieve 100 m.p.h., and not so long ago the XK 120 was regarded as just about the ultimate in potency! There is a wonderful sensation of having almost unlimited power under one's toe, and provided that this immense reserve is never abused, it can be regarded as a very real safety factor in time of trouble. they are sensitive and responsive in a manner which approaches perfection. As is sometimes found with an all-disc design, the hand brake is not at all powerful, though it has a pleasant "flyoff" lever. The high-speed stability of the car is excellent, and the driver may remain relaxed at over 136 m.p.h. Bumps, changes of camber, and an appreciable curve were deliberately essayed at this velocity without any drama. The Jaguar runs naturally straight and true, in which respect it greatly excels the earlier XK models. Having regard to its substantial construction and conventional chassis design, the XK 150S corners very well. It rolls less than the saloons of the same make, and is not addicted to screaming its tyres. Furthermore, the 3.8-litre engine may be called upon to provide a modicum of drift on even very fast curves. Its behaviour is always predictable, and there is nothing unusual about its handling. In brief, this is a very fast touring car rather than a tamed-down racing car, and should be treated accordingly, when extremely safe motoring will be the result. OVER 265 b.h.p. propels this luxurious touring car at speeds in excess of 135 m.p.h. in normal trim. This is an enormous velocity for a luxurious touring car, and in practical terms it means that there is spectacular acceleration available for overtaking, even at a Motorway cruising speed of 100 m.p.h. or more. The acceleration is of the kick-inthe-back variety right up the scale, but the potential figures could not be recorded because of wheelspin on the getaway. The 3.4-litre which I tested had a limited-slip differential. Such a component was presumably fitted to the "3.8", yet propeller shaft torque caused the right-hand rear wheel to spin all too easily. In consequence, the initial acceleration was inferior to that recorded for the earlier car, but only because the power could not be transmitted to the road, I would guess that a standing quarter-mile in 14 seconds, and other figures of a similar order, could easily be recorded if independent rear suspension were adopted. 120 m.p.h. in 4.2 seconds less time than the XK 120 took to achieve 100 m.p.h., and not so long ago the XK 120 was regarded as just about the ultimate in potency! There is a wonderful sensation of having almost unlimited power under one's toe, and provided that this immense reserve is never abused, it can be regarded as a very real safety factor in time of trouble. relaxed at over 136 m.p.h. Bumps, changes of camber, and an appreciable curve were deliberately essayed at this velocity without any drama. The Jaguar runs naturally straight and true, in which respect it greatly excels the earlier XK models. ordinary car. The engine is quiet, smooth and utterly responsive to the driver's smallest whim. One may drive all day without really pressing with the right foot, and yet' the knowledge that 265 b.h.p. is there for the asking is one of motoring's finest luxuries. A Jaguar driver ought to be a good driver, because he need never be in a hurry. The Jaguar XK 150S is an extremely fast luxury car that is even more delightful to handle when powered with the 3.8litre engine. Naturally, it uses more petrol in this guise, but the extra cost is certainly paid for in performance and flexibility. If one must find fault, the steering tends to be heavy for parking and the synchromesh is not particularly potent. Yet, all in all, it is a superbly comfortable car with an almost incredible performance, and if £1,000 were added to the price it would still represent excellent value. price £2,065 4s. 2d. including P.T. Engine: Six cylinders 87 mm. x 106 mm. (3.781 c.c.). Inclined valves in light alloy head operated by twin chaindriven overhead camshafts. Compression ratio 9 to I. 265 b.h.p. at 5,500 r.p.m. Three SU type HD8 carbs. Lucas coil and distributor. Transmission: Specially strengthened Borg and Beck 10 ins. single dry plate clUtch. Four-speed gearbox with synchromesh on upper three ratios and central remote control, plus Laycock de Nomanville overdrive. Ratios 3.19 (O/D. ), 4.09, 4.95, 7.16 and 12.2 to I. Open Hardy-Spicer propeller shaft. Hypoid rear axle. assisted. Centre lock wire wheels, fined 6.0016 ins. Dunlop RS4 tyres. Equipment: 12-volt lighting Speedometer. rev.-coumer, oil pressure and water temperature gauges, ammeter, fuel gauge, clock. cigar lighter, self parking windscreen wipers and washers. Heating and demisting. Dimensions: Wheelbase. 8 ft. 6 ins. ; track. 4 ft. 31 ins. ; overall length, 14 ft. 9 ins. ; width,S ft. 4t ins. ; turning circle, 33 ft. Weight, 28t cwt. secs. ; 0-50 m.p.h., 6.2 secs. ; 0-60 m.p.h., 7.6 secs. ; 0-80 m.p.h., 12.8 secs. ; 0-100 m.p.h., 19 secs. ; 0-110 m.p.h., 22.2 secs. ; 0-120 m.p.h.. 27.8 secs. Fuel Consumption: Driven hard, 13 m.p.g.